I have friends who pick complicated men. I pick complicated genes. As a PhD student, I worked on genes stuck in heterochromatin that tended to be HUGE (hundreds of thousands of base pairs, mostly introns, mostly repetitive DNA). My last publication (eons ago in 2012) was about a gene that went and quintuplicated itself. For my post doc, I worked on Lamin C, an essential gene nested inside the intron of another essential gene called tout velu. What fun! The mechanism of this progeria is still not at all clear. How does a mutant nuclear envelope protein cause rapid and system-wide aging? Do the stem cells fail to replenish themselves? Is differential gene expression messed up? I don’t think any one knows. So lamins are interesting. They are also very highly conserved – in animals anyway. Plants seem to have something similar but via a separate evolutionary pathway – a kind of convergent evolution. Among animals, invertebrates tend to have only the B-type lamins, while vertebrates have the A and B types. EXCEPT that Drosophila has two types. 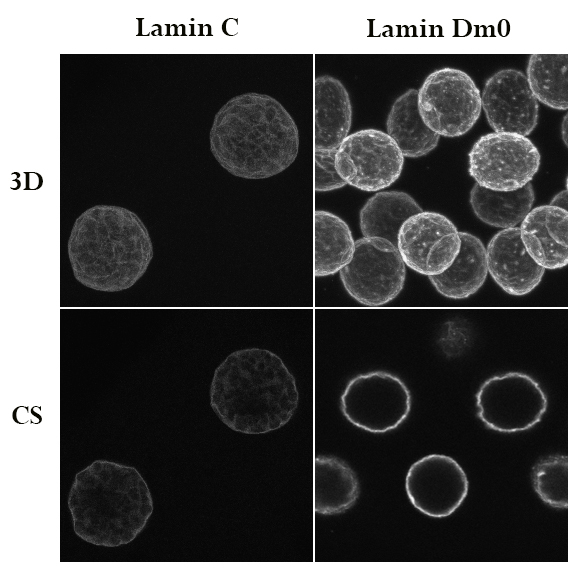 There is the B type, in flies called Lamin Dm0 (strange name deriving from its initial discovery involving different forms in the cell cycle) and the A-type called, confusingly, Lamin C. Why Lamin C and not Lamin A? Has to do with something called a prenyl group, and the mechanics of lamin incorporation into the nuclear envelope. It is horrible to explain and I distinctly recall my colleagues’ eyes running and noses bleeding whenever I tried so I won’t go on about it just yet here. Suffice to say that lamins are either prenylated or not, which means they either have a pointy-branchy sticky carbohydrate membrane anchor attached to their C-terminus, or not, because sometimes it gets clipped off post-translationally, which is what happens to human Lamin A. Human Lamin C turns out to be an alternatively spliced version that skips the bit of the gene that encodes the signal to put the anchor on, so it is never prenylated. Drosophila Lamin C is like that too, the gene does not encode a prenyl anchor. And it is true that when you compare the physical location of Lamin C and Lamin Dm0 using confocal microscopy, Lamin C tends to be both at the periphery and in the interior; Lamin Dm0 is more concentrated at the envelope (see figure – sorry no scale bar but the (polytene) nuclei are each about 15-20 microns across – 2 different mags). Hence, my interest in Lamin C. Well, me and MANY other people. During my post doc I worked on generating a mutation in dLamin C (LamC) which turned out to be a bit tricky because it is nested inside this great big giant essential gene called tout velu (ttv: French for all “all fuzzy” – plays a role in Hedgehog diffusion and pattern formation…another story: PMID:9665133). So making a mutant meant generating a lesion in LamC without disrupting tout velu. 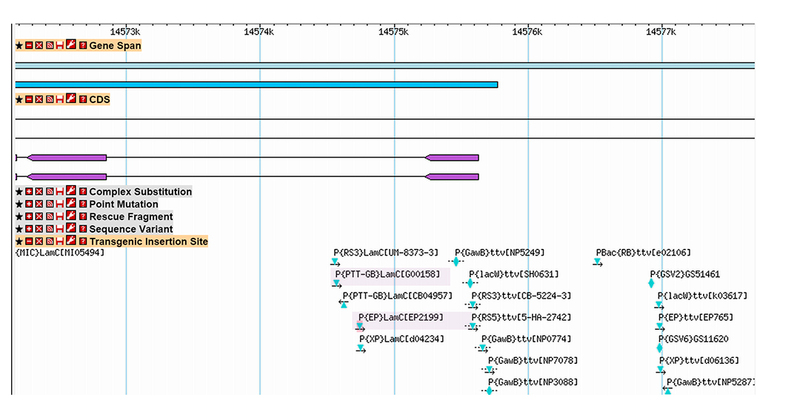 Here is what it looks like in Flybase: the blue line ticks are 10kb apart so ttv is a pretty enormous gene. But that is all ancient history. We made nice mutations and characterized them and it was great fun. There are other mutants about but some of them are iffy – so I wanted to make a new one, using the same method – imprecise excision of a transposon hit. With mutants, the more, the merrier. Most importantly because if you want to use a mutant to study something biological, you have to worry about what else got buggered in the background when you made the mutant, and is that buggery causing the interesting biological effects you are seeing. So duplicating a given experiment with mutations in the same gene but from two different genetic backgrounds is really important. First thing is to find a fly strain with a P element (transposon) inserted in the right place. There are lots, but finding one that affects LamC without affecting ttv is hard. I highlighted the two best choices below. G00158 is what we used all those years ago during my pos doc (PMID:15965247). They are both in LamC’s first intron, When I started here at WWU I chose EP(2)2199 which is no longer available (probably because it was unhappy and kept dying for reasons that will become clear). So that is where this story begins.